Daniel Jenkins had a career-high 139 yards and two touchdowns in Arizona's season opener, when he started in place of the suspended Ka'Deem Carey. TUCSON, Ariz. –– If only every play were a 91-yard run for a touchdown. Life would be grand. "Runs from the 9-yard line," he fondly recalled of the run that kick-started what turned out to be easily the best game of his five-year career at Arizona. I can’t say that I regret the decision at all, because I’m happy. It is what it is … I’m content. "People ask me all the time how I’ve handled it and how I’ve been able to maintain a level of professionalism," Jenkins said over the weekend, "but at the end of the day, you have to be professional. You may not like it, but you definitely have to maintain it." 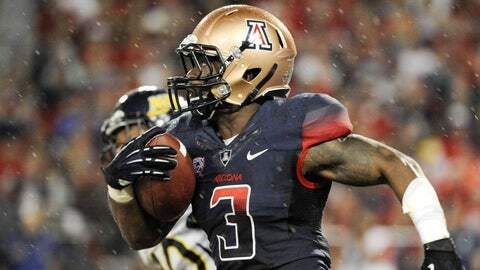 "I’ve been really proud of him," Arizona coach Rich Rodriguez said. "Ka’Deem (Carey) is one of the best in the country, but when Daniel has had the opportunity, he’s made the most of it. He’s been a great leader for us. "I’m proud of the way he finished (his career) at the place he started. He’s had a great attitude, and he can play. We’ve always considered him a starter." "I can’t say that I regret the decision at all, because I’m happy," said Jenkins. "It is what it is … I’m content." "I’m going to give it my best effort to get to the next level," he said. "I know I have the ability. The coaches have said I should at least try. If, God forbid, it doesn’t happen, it’s meant to work out that way." If it doesn’t, he quickly responded, "I’ll coach." "I have the experience," he said, adding that he’d like to be a running backs coach. "I’ve done it for five years. I’ve played for two different coaches (Mike Stoops and Rodriguez) and five different running backs coaches. I’ve sucked in as much as I’ve can." "He’s got a lot of recommendations from our staff," Rodriguez said. "I think he has a great career in the profession." Whatever it is, he said, "I’m excited about every opportunity that will come my way. I’m sure I will be successful with it." He has that much confidence in his abilities — and his faith. It’s part of what guided him back to Arizona last year. He didnât burn any bridges when he left, and he continues to feel that the circumstances of being Carey’s perpetual backup were simply the way things were. "How do I feel?" he asked. "If I didn’t (feel good about his decision), then these opportunities to be a coach might not have shaped up that way. Maybe that’s my route. I’m taking it in stride. I have strong faith. "And because of that faith, whatever has happened has worked out for the best. I didn’t play as much as I thought or expected, (but) it’s about the experience." And in the end, isnât that what college is all about? Save for a 91-yard run.